The WELSTech summer wiki migration series continues with discussion of technology to assist with worship planning and media projection. Social media tools take center stage for tips and picks, and Martin shares a free heart rate app that checks heart rate using the iPhone camera! Resources for worship – Martin and Sallie continue the WELSTech Wiki migration with a focus on worship resources, including the helpful Google Lectionary Calendar. Request an account on our new wiki – welstechwiki.gapps.wels.net – and add your worship planning ideas, sample worship folders and multimedia sources. This week on WELSTech we unveil the brand new WELSTech Wiki to kickoff the 2014 wiki migration summer series. Listeners might experience a bit of deja vu as Martin and Sallie unknowingly replay past show features plus we share the amazing story behind our newest WELSTech Hall-of-Fame member. We’re planning a WELSTech Conference in July 2015 and the call for presenters will be issued soon. 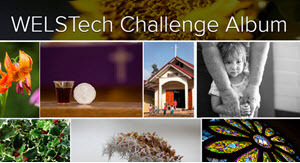 Watch for the announcement and consider what tech-in-ministry topics you may want to present to others. Shout out to Noah Jorgesen, the newest member of the WELSTech Hall-of-Fame! From the WELSTech Presentation/Teaching Videos Playlist, watch Thumbs Up for Rock and Roll!